Over the past few months I've been cutting out a lot of processed foods and amending recipes to be more healthy. I've discovered Almond meal to be a great replacement for flour and I've also been replacing butter/marg with olive oil. I tried some Banana Muffins on the weekend and they were delicious. I did make some amendments to the original recipe and next time I reckon I'll tweak it some more by replacing the 1 cup of SR Flour with wholemeal flour and taking the sugar out altogether and perhaps adding a bit more golden syrup/honey to compensate. The original recipe can be found here. And below is my version. I've made a note on my recipe as to what changes I made from the original. No need for a mixer either, I just used the whisk to gently mix all the ingredients together...simple and quick! I'd love to hear of how you have altered recipes to be a healthier option. They look and sound delicious. I have been reducing the amount of sugar in all recipes, and it still tastes fine. 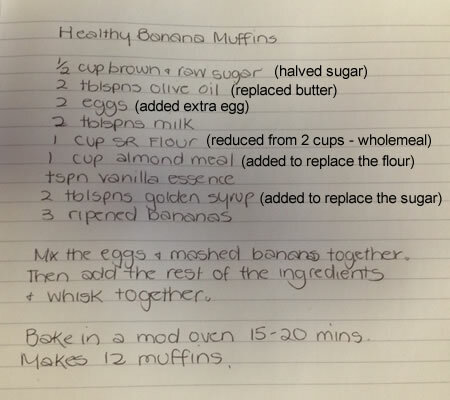 Will have to get some bananas and keep them aside for trying this recipe. Thanks for sharing. 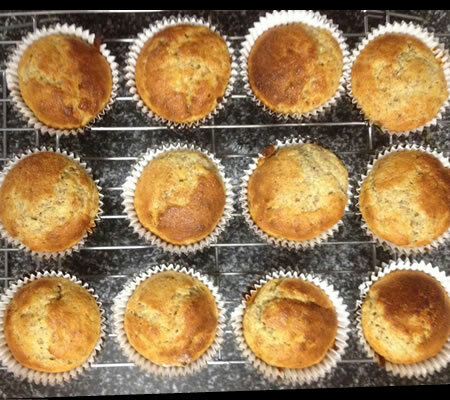 They sound good, I've been replacing butter with olive oil (or canola oil) in some of my recipes too, I've found that reducing the sugar sometimes changes the texture of the finished product a bit, but not in a bad way, and I always jot down what I did so I can replicate it again.